We were recently introduced to Full Moon, a fourth generation family owned company that has been making and delivering food for the last 40 years. Full Moon believes that if it's not good enough for them than it's not good enough for our pets. All of the ingredients are sourced in the United States all while supporting local farmers. Full Moon pet treats are Made in the USA, using regionally sourced, high-quality 100% human-grade ingredients. All of their treats start with USDA approved meats raised on family farms throughout the US. To ensure that every dog gets the best all-natural protein, you will not find any artificial preservatives or chemicals. Full Moon pet treats are mostly made up of meat and few carbs. Therefore, they are wheat, corn and soy free. They contain no animal meals or flavor enhancers. We were delighted when Full Moon sent us a bag of Chicken Jerky Hip + Joint to give a try. Made from all natural sliced whole chicken breast from US family owned farms. They contain US sourced chondroitin and glucosamine for healthy hips and joints. Turmeric is added which is known to help reduce inflammation. They are grain free and contain no corn, wheat or soy. As with all new treats, Maggie only had a few bites to make sure they agree with her. If it was up to her she would have eaten the whole jerky treat but it was easy enough to break apart and share with Miley and Maggie. If you'd like to try them for yourself they are available nationwide at Target, Amazon, Tractor Supply Co, Kroger, ShopRite and many more. Go here to find a store near you. If you'd like a chance to win a bag of Full Moon treats enter our giveaway! Giveaway: One lucky reader will win a bag of Full Moon treats by entering the rafflecopter form below. Giveaway is open to US residents and ends on Friday, Nov. 7th at 12:00am EST. 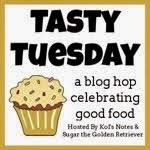 To help spread the word about Full Moon and the giveaway, we are joining the Tasty Tuesday Blog Hop hosted by Sugar and Kol. Disclaimer: We received a bag of Full Moon Treats for review. All thoughts and opinions are our own. These look like something Arty could really sink his teeth into!!! He doesn't get chew treats too often because the rest of us don't enjoy them! I am very particular about what my dogs eat. Grain free and USA made/sourced ingredients are a must. These treats meet those standards and I imagine my pups would go nuts over them. This post made me really sad...why? We did our review like two weeks ago, and now we are down to our last jerky...we hate to be almost out because it is so tasty! 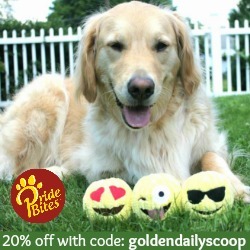 We are always looking for tasty treats to reward our dogs for being awesome! 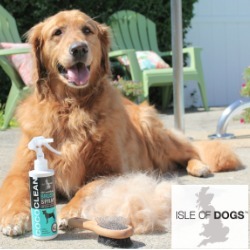 We'd love to win a new (to us ) brand to try out! I want to win a bag of these treats because they seem like they would be really good for my dog and I know he would love to have some. my dogs are sitting so nicely for a treat! They look like a good treat for my kids and they deserve the best. We have never tried these before...but chicken jerky is something that both of the girls really like! They do need to be rewarded when they do something AWESOME!! I have three dogs that love treats. I have five Treeing Walker Coonhounds and three cats (all rescues). Suffice it to say we go through a LOT of food and treats. My pups all love jerky treats, but with the problem with the treats coming from China, I haven't bought them too often lately. I'm still trying to find the perfect Made in the good ol' USA brand. These sound great. I would like to win because our 2 dogs would love them!! That tumbler-full of jerky is quite the tease! Hope you got paid well for your modeling duties, Maggie! Ut oh . . . mom caught me licking the computer screen! Well, we sure would love to try those jerky treats. We love all things jerky IF they are USA made. We are going to have to get Mom to look for them. Those look yummy. You are getting to try all kinds of great things lately. Oh my, yum, yum, they do look very edibles ! They do look good and good luck to all in the giveaway. Have a wonderful Wednesday. These look wonderful. We are always looking for new treats to try! 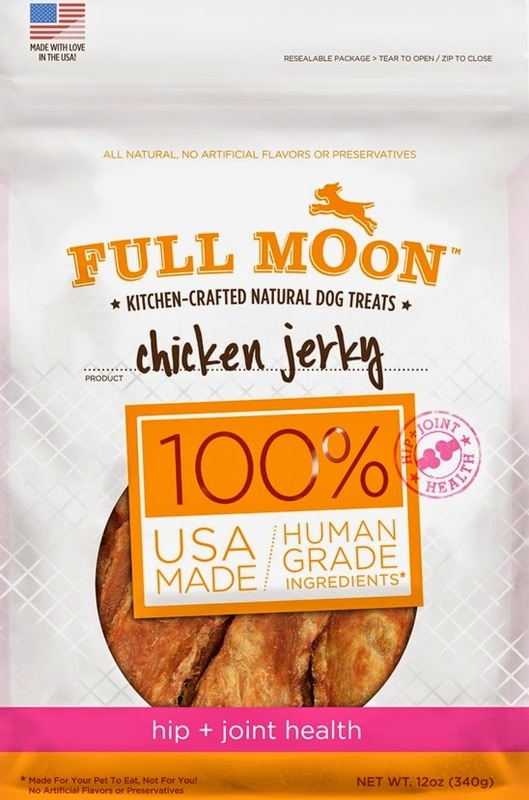 I would love for my dog to try Full Moon Dog Treats due to their reputation of being a really high quality treats company. I love that the treats are made from all natural sliced whole chicken breast from US family owned farms. 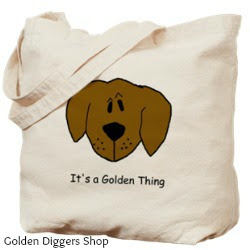 I am always on the look out for good quality made in the USA treats. My pugs love chicken and jerky so I bet they would love this. I would love to try it and see if this is something my puggies would love. Nice to see good quality treats being made in the USA. We've never tried them before and I have a very picky German Shepherd. I would love to give them a shot. We've been seeing these everywhere, and they sound so good, we think we're missing out. So we need to win some! I would like to win because I have a beautiful dog, Halo, who is getting older. Her joints are starting to get a bit sore so I would love something that is good for her. Reading that they are made from Human Grade food, and has all the USDA approval. I would like to win because my rescue pup would love to have a yummy snack! Treat time is one of her favorite times of the day. My English Bulldog's favorite word is "treat". We are always looking for something healthy and tasty for him. Our dog is such a picky eater that we would love try a healthy option that we think he may enjoy. I have 2 dogs a cocker spaniel names Mocha and an English Springer Spaniel named Marley and they love their treats. I buy all-natural treats for them. My cocker spaniel has some skin issues. I'd like to win because I do a lot of training and go through a lot of treats. These seem like they'd be very high value for my boys. 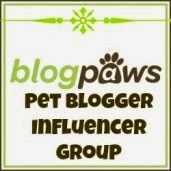 I would like to win becuase we have 4 dogs & 4 puppies & treats are a great way to train them. My dog responds well to treat training. 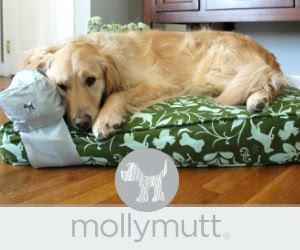 I'd love to take these to my friend as a gift for her dogs the next time I visit. I'd like to win a bag because our Sammie deserves a treat. I would love to win a bag of treats because they always come in handy for training and rewarding my dogs for being such awesome furkids. Oh I would love win and try these for our dogs. We have been buying only USA made treats and love that these are human grade! Because we're out of dog treats! They can get expensive! i would love to try these for my lucy!!! they look delicious and we are very careful about the treats we give her and these look great! no made in china in this house. I'd like to win because I'm always looking for fun, tasty new treats for my pups! My sweet loyal baby girl Lucy deserves some amazing treats. We have this adorable little dog who would love to have treats. My husband has been training her to catch them. I want to win because I do not trust treats that are not made and sourced in the USA. 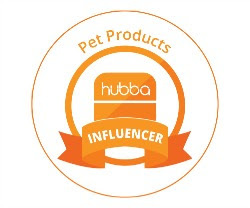 I'd love to win because these treats are healthy and safe for my dogs. I would love to win because I have a Beagle that LOVES his treats and would really love these! I would like to win because my dog loves trying out new treats! My son's dog I think would like these treats if I win. I'd like these treats because I think our daughter's Pomeranian would love them! I want to win because my dogs love treats but it gets hard tryinh to find good treats that are made in the usa. These sound great.